First, lets take a look at the Advanced Threat Protection steps for a proof of concept (PoC), and then later we will look at the new Office Smart Links feature. Hybrid with MX on-premises and then mail flow to cloud is possible for an advanced PoC, but here it depends upon what the customer has in-front of on-premises. 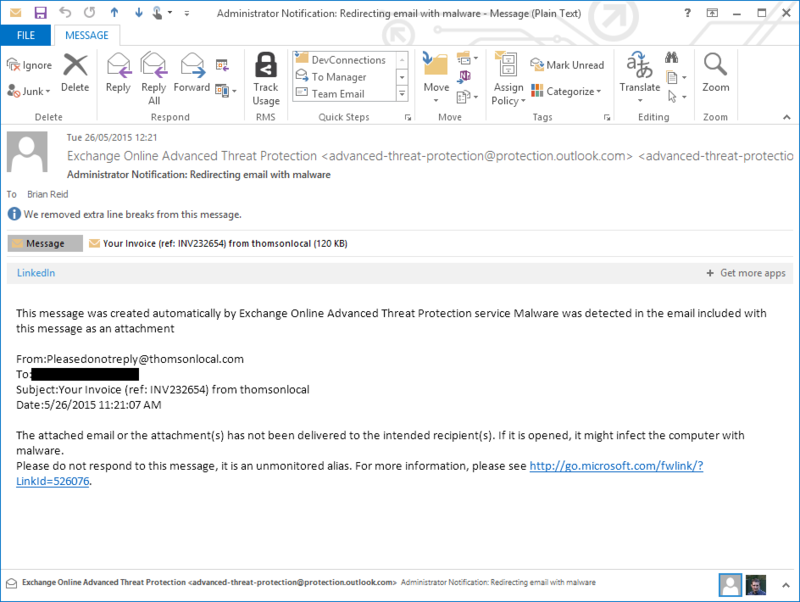 If this is the case, then a simple PoC with a new email namespace and MX to EOP is recommended before transitioning to protecting their actual mailbox. 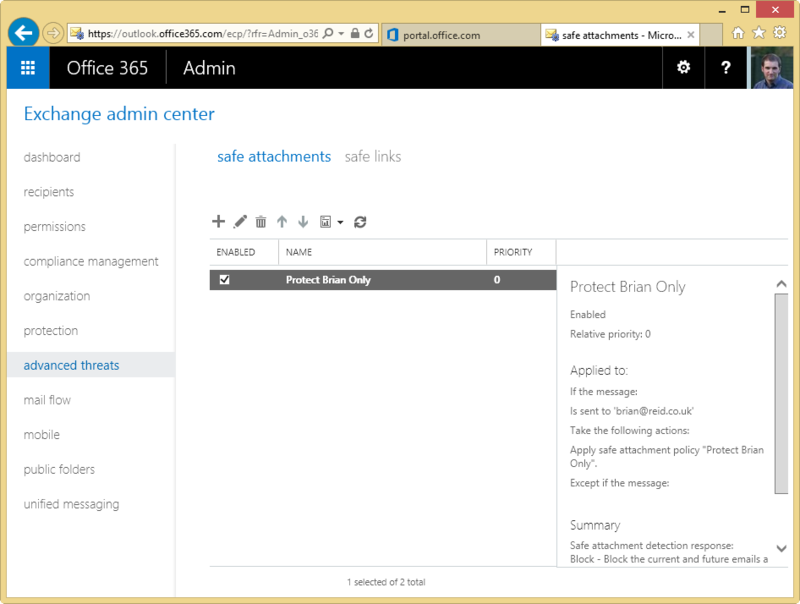 Create ATP rules in wizard in Exchange Control Panel for both Safe Attachments and Safe Links. PowerShell is pointless for this, as there is not a lot to do, and there are more steps if do it via PowerShell! 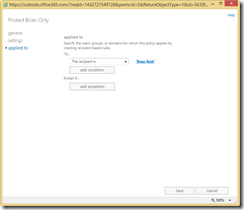 Enable ATP for a selected mailbox(es) and not an entire domain. Mailboxes can be cloud or on-premises. 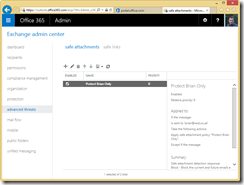 Enable Smart Links for same mailboxes. Mailboxes can be cloud or on-premises. 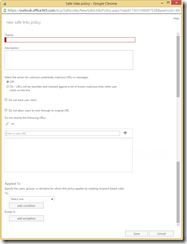 Check if org has rules to block .exe attachments. If they do then exe’s will be blocked by this rule and not processed by ATP. Test. 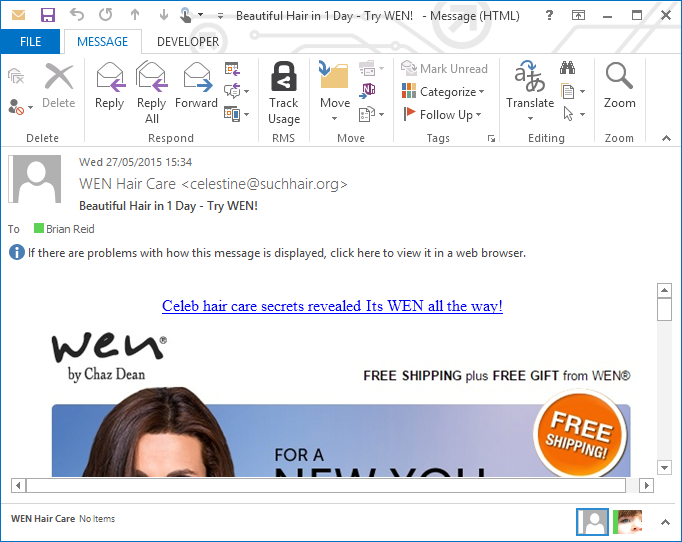 I have sent the .NET Framework installer .exe in email before to test this. But at any given day or time the rules could change as to what is blocked or not. I used to have a “fake macro virus” document (see below), but OneDrive’s built in AV started detecting it and now I do not have the file anymore! The doc I used to test with had an autorun macro that set a regkey that included the words “I download stuff and drop files” or something like that! 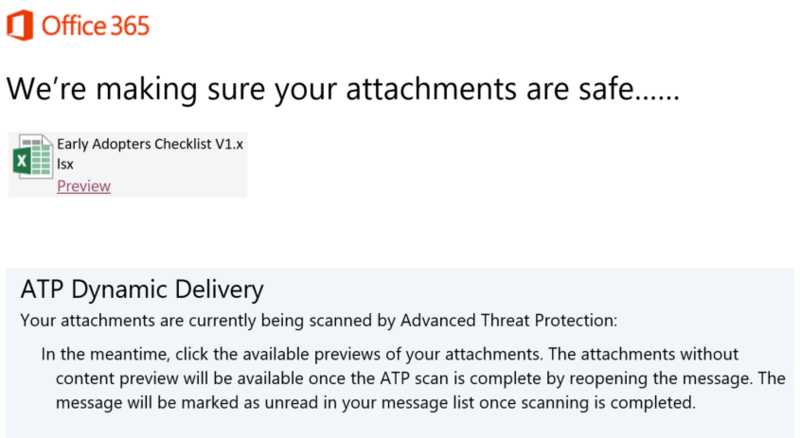 It might be possible to create your own document, but watch out for AV software and the like blocking it and/or deleting it, or it being filtered out before it arrives at the target mailbox. 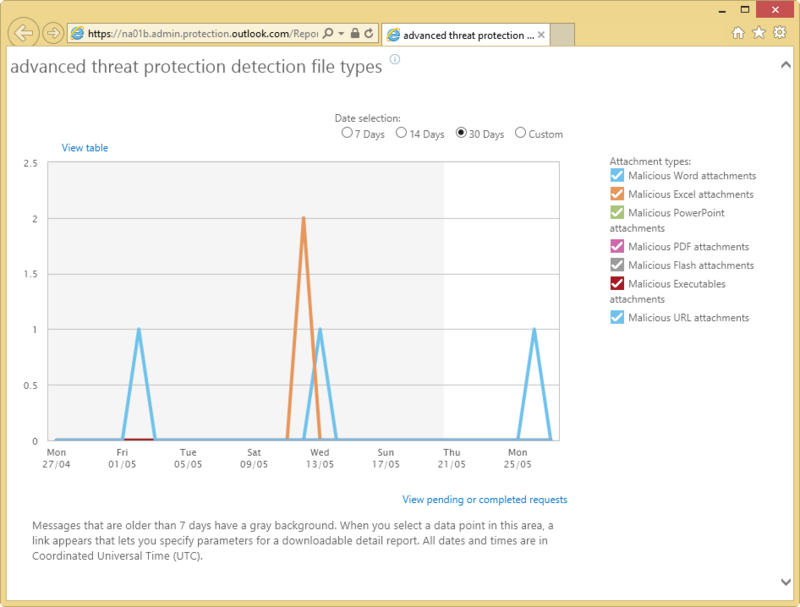 I did say above this PoC is quite hard to do when trying to send malware for detection! 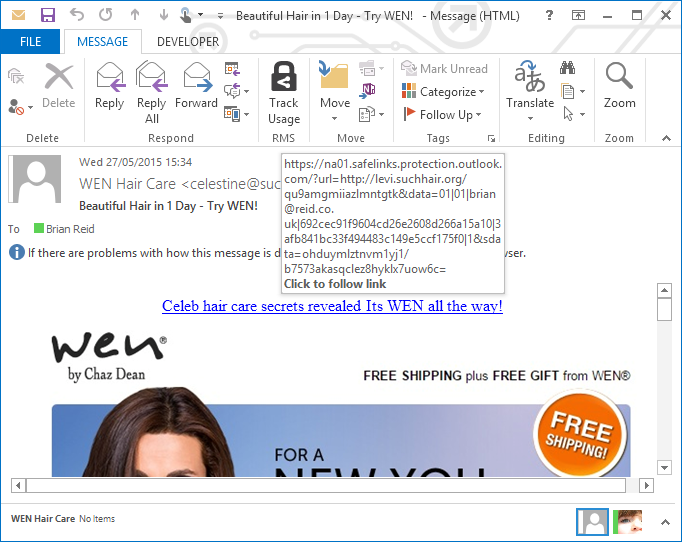 For SafeLinks, send an email from external that contains a URL with www.spamlink.contoso.com in it. The link will be rewritten. Some common links are never rewritten (I think www.google.com falls into this category) and you can whitelist URLs as well company wide. 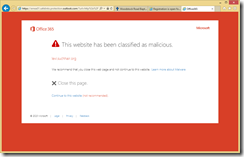 So if you whitelist a URL, send an email from the internet containing that link. That is a useful addition to the PoC as well. 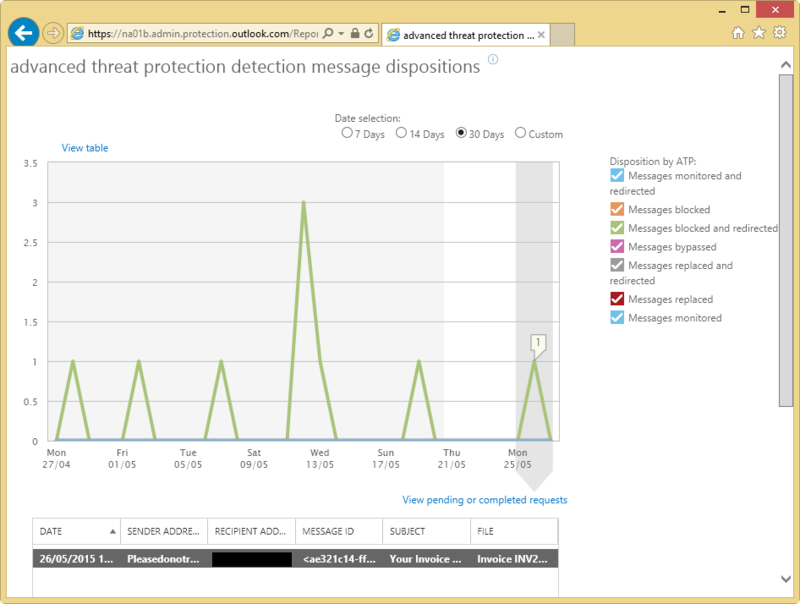 ATP now quarantines (or at least its coming soon) the failed attachments, so include that on a demo. 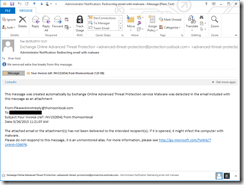 I have found that forwarding failed attachments to another mailbox (like a shared mailbox) is a bit temperamental – hasn’t for at least a year in one of my tenants but does in another tenant. 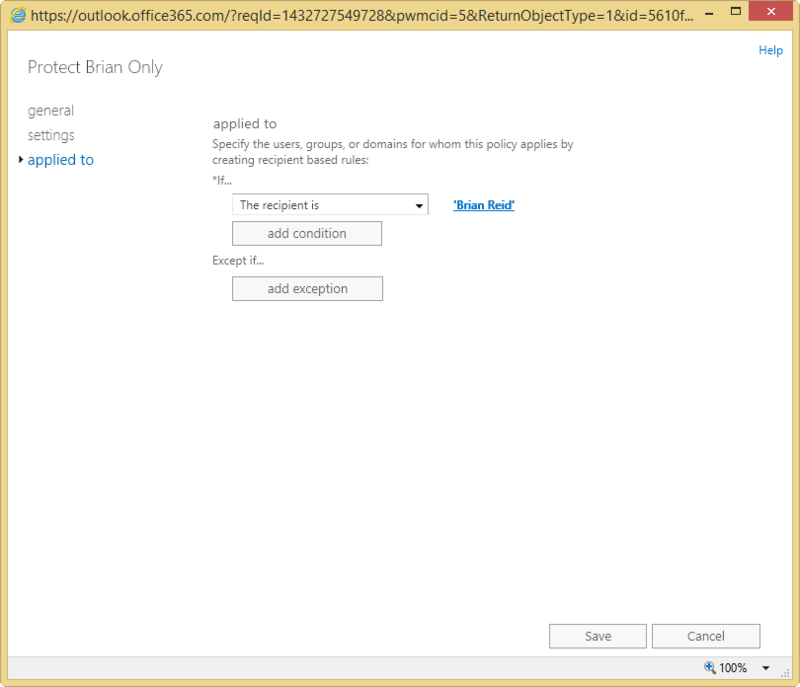 If users are on-premises (EOP before an on-premises mailbox) then do not enable dynamic delivery. 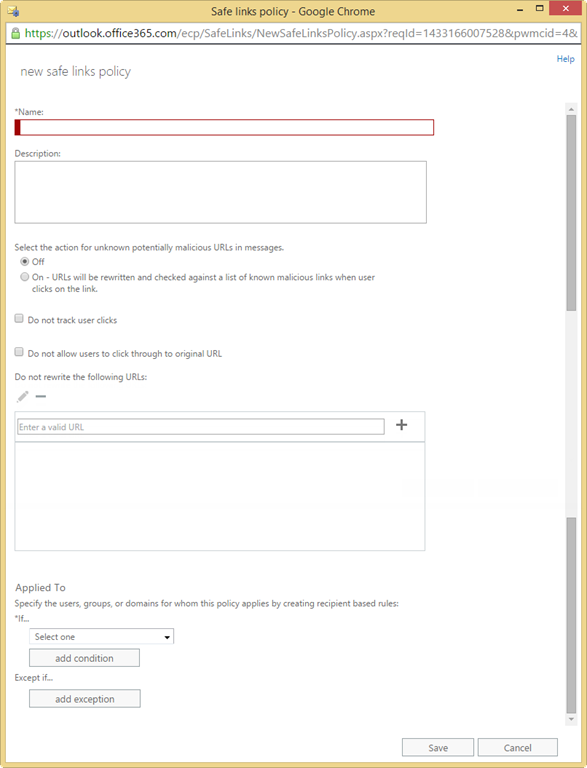 If PoC mailboxes are both on-premises and cloud then create two ATP rule sets, one rule for each type of mailbox, and enable dynamic delivery for cloud mailboxes only. Dynamic delivery sends the message without attachment to the cloud mailbox and later writes the attachment into the message body. This works in the cloud as Microsoft manage ATP and Mailbox. 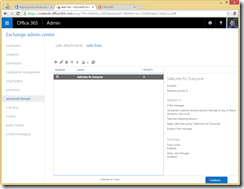 It cannot work on-premises as Office 365 cannot write the modified message into Exchange Server at a later time. Dynamic delivers the body but not the attachment instantly. Attachment, if safe, follows later (7 or so minutes I tend to find). 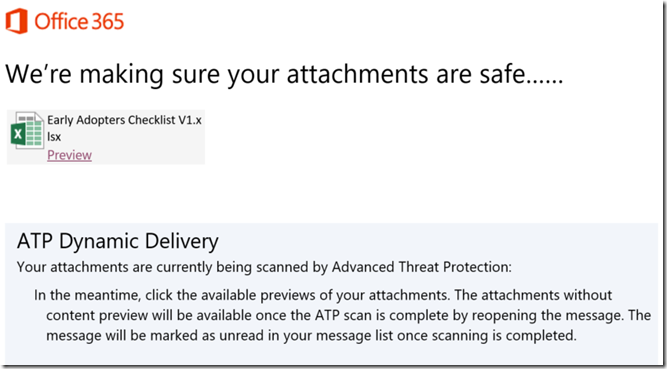 I understand an option to view the content of the attachment in a web browser but not the attachment is coming, but I have not seen that yet) – suspect the link to this will be inside the “pending attachment notification” in the dynamic email, but am guessing at this. 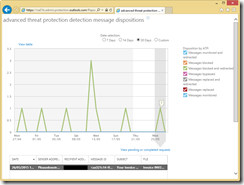 Do not dynamic deliver to on-premises mailboxes. 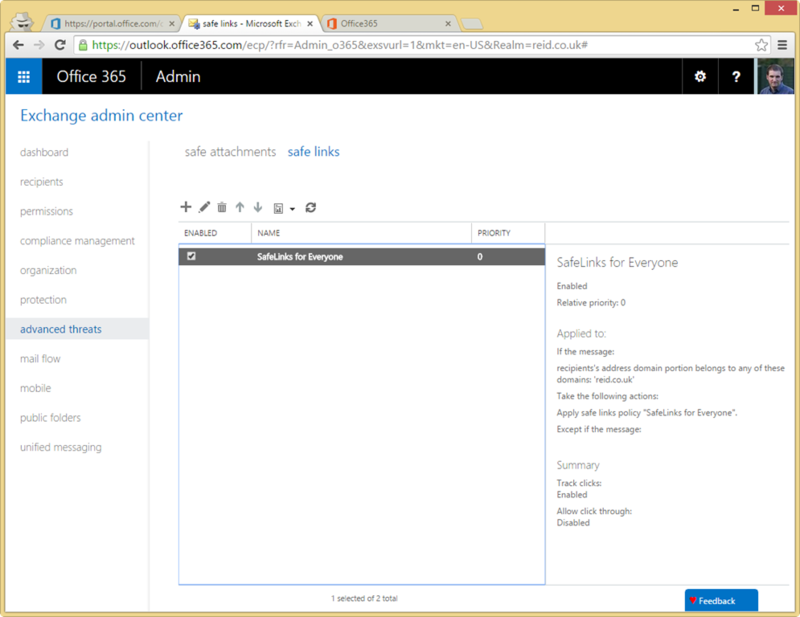 Demo that internal emails do not SafeLink rewrite and attachments are not processed. 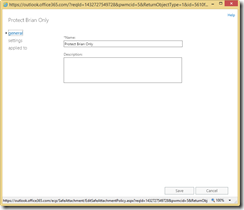 That is, send an email between two internal mailboxes and show that it is not processed. In hybrid mode, if the connectors to the cloud are set up correctly then internal email from on-premises to cloud should not rewrite links. 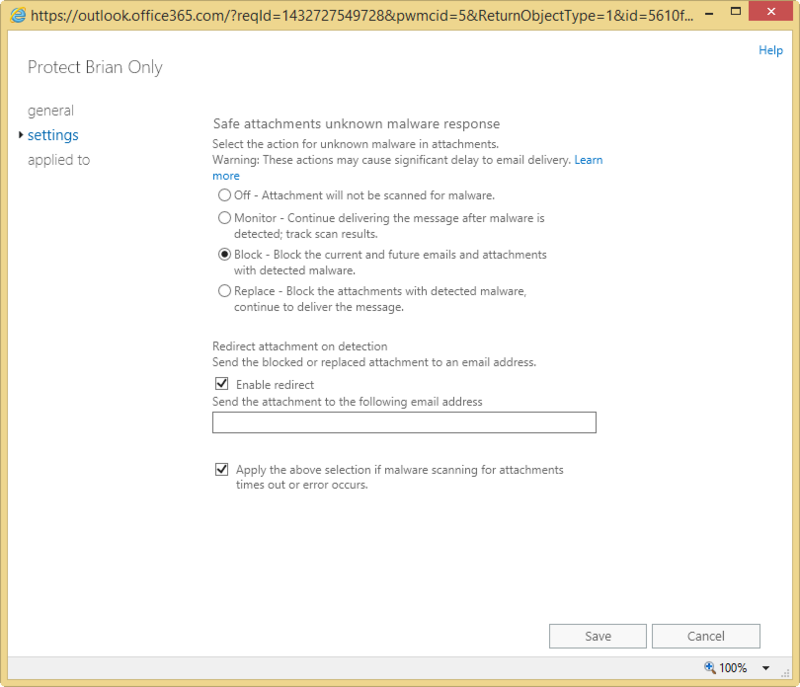 External emails are marked as such when they arrive on the first Exchange Server and so an external email to on-premises and then via the hybrid connectors to Exchange Online should be processed, as Exchange Online knows it is external! Attachments are always scanned when sent between senders, even in hybrid mode (on-premises to cloud) or within two mailboxes the cloud. 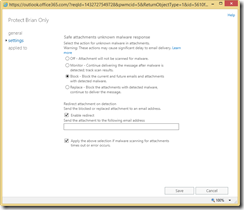 Enable ATP for direct attachment links (i.e. 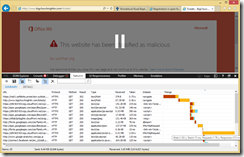 link directly to an exe, pdf etc.). Then email and click that link. ATP with a yellow background will popup saying the file needs to be scanned. 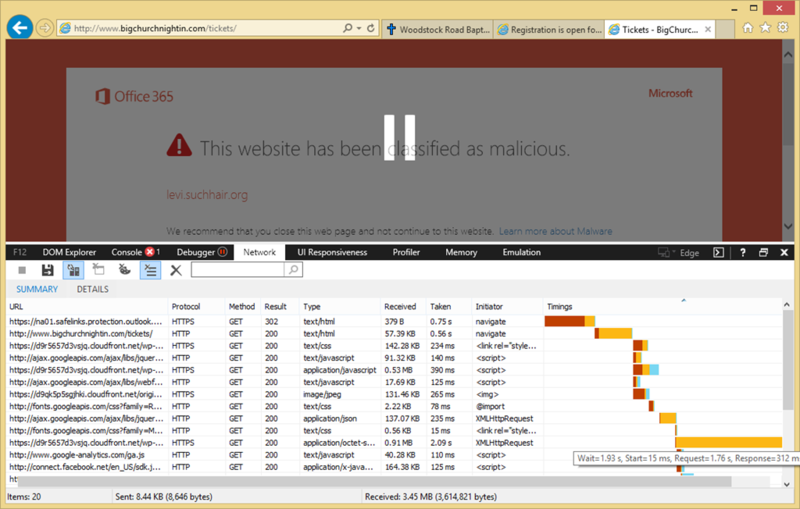 After a while (7 minute or so) click the link again and you will get to the file directly. 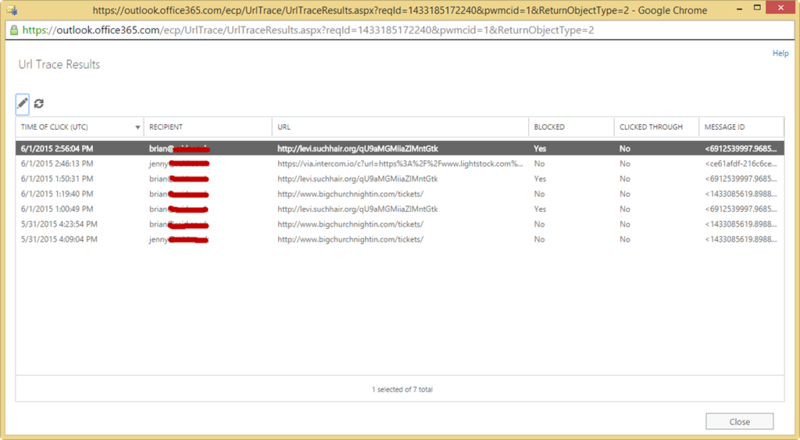 Safelink URLs are geo based. 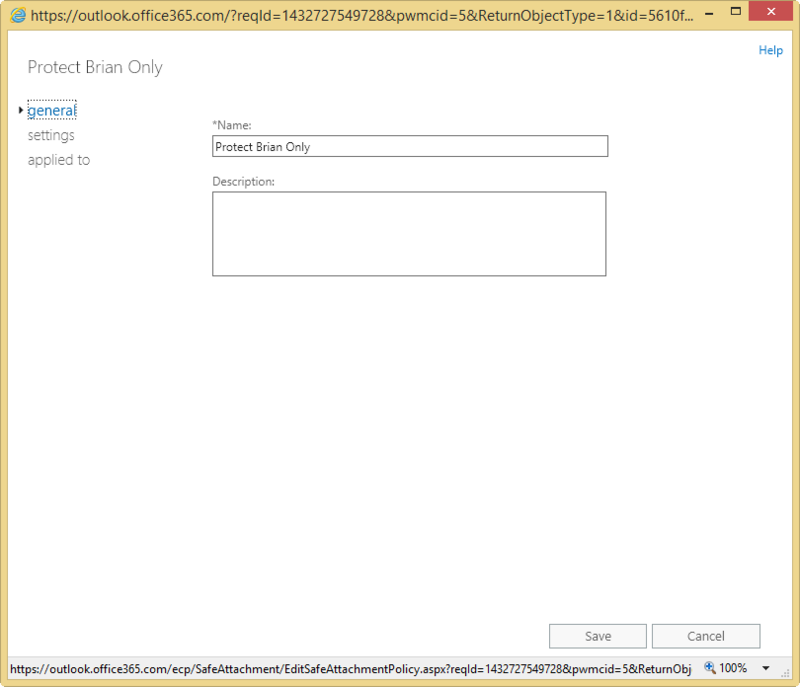 So EMEA tenant (or UK tenant) will get emea01.safelinks.protection.outlook.com rewritten URLs. UK tenants have EOP in EMEA, so the links for UK tenants are the same as EMEA tenants (at this time, not sure if this is changing). 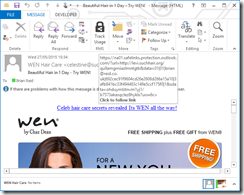 Send emails that are both HTML based and Text based, and use the range of clients that the end customer users to see experiences. 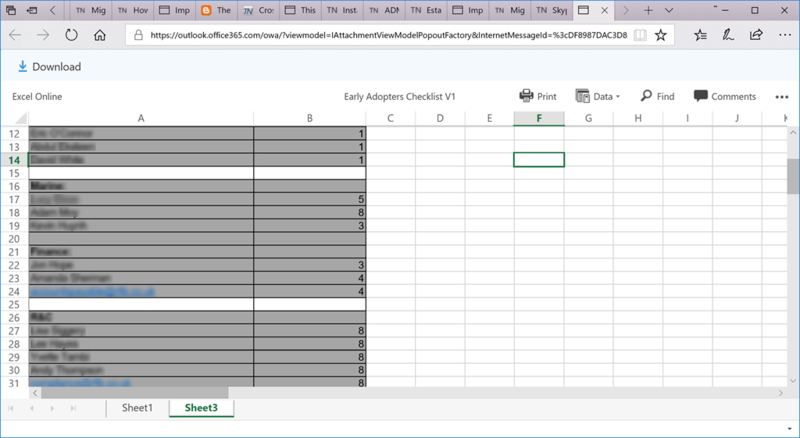 Rewriting text formatted emails appears different than html formatted emails. 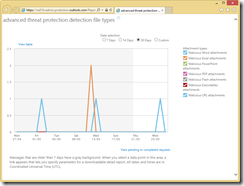 On a Win10 not AAD or legacy Windows client then save the file to OneDrive for Business sync folders or SharePoint sync folders. It needs to be saved to these folders to know that it is a cloud document. Get a demo machine that syncs to multiple tenants and later save a copy of the file OneDrive sync folders for the unprotected tenant. In this scenario you will see a protected document become unprotected (or visa versa) as you change the folder where it is saved to. 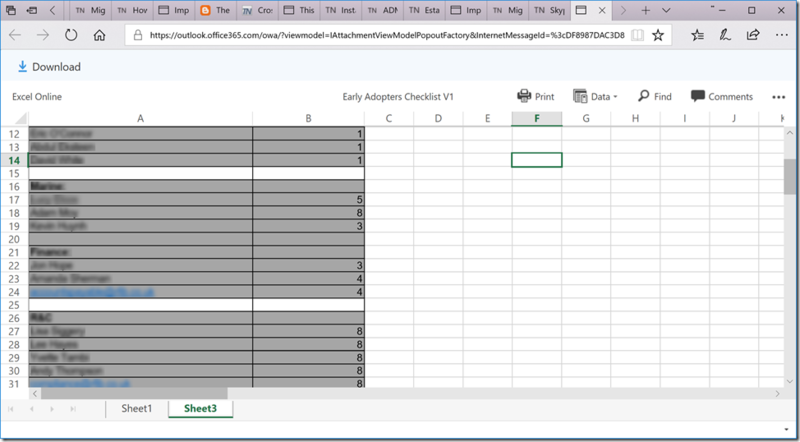 Once you have the file start creating content in it (typing “=Rand(20)” without quotes is a good way to do this in Word) and then start adding some links to the document. Use the above mentioned test link as well.